Let's face it -- I am openly gray. At age 61 it isn't too early to at least begin thinking about retirement, so when I ran across this picture I said to myself, "Self, wouldn't this be a terrific retirement spot?" Getting a seaplane endorsement isn't difficult -- and there's a wonderful seaplane training facility located at beautiful Lake Como in Italy that would be an ideal place to go. As a matter of fact, this is at the top of my "Bucket List." And this particular cottage doesn't look overly large or expensive, all things considered. So there you have it -- this surely isn't too much to ask for. Or is it? Of course, as I always say: "I either get what I want or I change my mind." "Has Tarantino ever made a singularly authentic, sincere, innovative frame of film in his life?" DEATH PROOF is Quentin Tarantino's feature-length contribution to GRINDHOUSE, the twin-bill gore-fest which was intended to be a homage to the classic, albeit classless, drive-in B-movies of the 1950s and 1960s. Combined with several fake movie trailers and Robert Rodriguez's full-length PLANET TERROR, the total running time for this patronizing pastiche was a whopping 191 minutes. Overly long and ultimately disappointing, GRINDHOUSE was a box office failure. Well Tarantino and Rodriguez and the Weinstein's, Executive Producers Bozo Bob and Hapless Harvey, re-released both films as single offerings and the staff at Needtovent recently screened DEATH PROOF thanks to the fine folks at AMC which, in this case, could very well stand for Agonizingly Mindless Cinema. 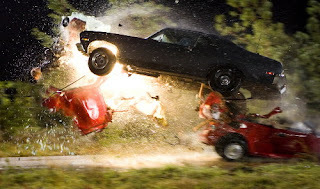 DEATH PROOF stars Kurt Russell as Stuntman Mike, a psychopath who uses his heavily reinforced muscle car as a killing machine to annihilate unsuspecting, beautiful young women who have a propensity to bare their belly button. The navels are nicely shaped, lint-free "innies" -- just what any red-blooded hormone-driven fella would find arousing, for lack of a better word. But Stuntmn Mike has a hard-on of a different nature for these nubiles; what/why is never divulged. And what Stuntman Mike forgets is that Hell hath no fury like a woman being creamed by a big bore Chevy. Sounds promising enough, but the biggest bore of all is the incessant bantering among the various broads which bogs down any momentum until the very end. By then, one hardly cares. 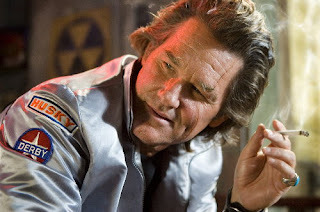 On the bright side, Russell's hypnotic/psychotic Stuntman Mike is a fun character to watch. And the legion of libertine, libidinous lounge lizards provide appealing eye candy at first, at least until their incessant droning makes you want Stuntman Mike, or anyone for that matter, to reach for some duct tape or, perhaps, a Louisville Slugger. We have not screened the other full-length component of GRINDHOUSE, but it appears that Rodriguez also missed the mark. Quite frankly, we doubt we will even bother trying. Instead, we plan to grab a six-pack or two of Lone Star longnecks and pop into the old VHS machine a copy of FASTER, PUSSYCAT! KILL! KILL! Old Coot: "Women! They let 'em vote, smoke and drive -- even put 'em in pants! And what happens? A Democrat for president!" Sorry Quentin, when it comes to the grindhouse genre, no one does it better than Russ Meyer. 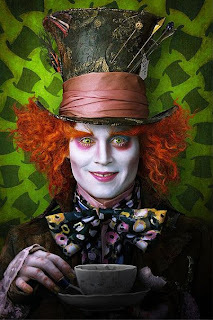 Coming up next for Johnny Depp is the role of the Mad Hatter in ALICE IN WONDERLAND. 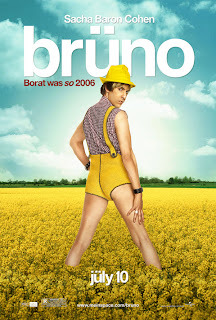 This Disney release is currently slated for March 5, 2010. The entire staff at Needtovent.com is anticipating another brilliant performance by what is arguably the finest American actor currently gracing the silver screen. As Director Tim Burton states, "Johnny definitely gets ALICE IN WONDERLAND. He's probably been there himself many times." And so we wondered what might be the next step for Mr. Depp. The answer surprised us. As Alice would say, things get "curiouser and curiouser." 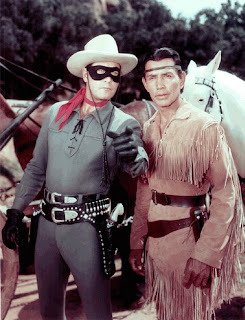 Reportedly, producer Jerry Bruckheimer aims to reintroduce a classic Western franchise, THE LONE RANGER, with Depp (whose maternal grandfather, not incidentally, was Cherokee) as Tonto. Writers Ted Elliott and Terry Rossio have been selected to write the script for the live-action big-screen adaptation of the classic 1930s radio show. Besides writing SHREK, THE MARK OF ZORRO, and NATIONAL TREASURE: BOOK OF SECRETS together, Elliott and Rossio are the duo that brought us all three of the PIRATES OF THE CARIBBEAN adventures. Remaking THE LONE RANGR is essentially a risky undertaking in this day and age where Westerns continue to flop no matter how good they are (PALO PINTO GOLD being a rare exception). But one could've said the same about pirates and octopus-headed villains back before the first PIRATES OF THE CARIBBEAN plundered the box office in 2001. However, THE LONE RANGER seems a bit more daunting. The character's most recent shot at the big screen, 1981s THE LEGEND OF THE LONE RANGER, failed so badly that the film's star, Klinton Spilsbury, never worked in Hollywood again. While no one has yet been signed to play the title character, there have been clues that George Clooney is being seriously considered for the role forever made popular by Clayton Moore. 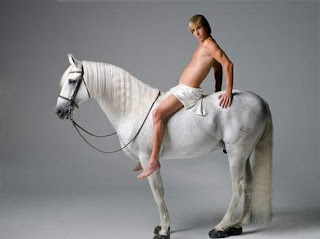 If this will bring an end to the looney Clooney's overinflated career as well, we say go for it.